To view images click on left navigation column. Brief introductory comments follow. This section contains a variety of views of the Euphrates River near and to the north of Carchemish. 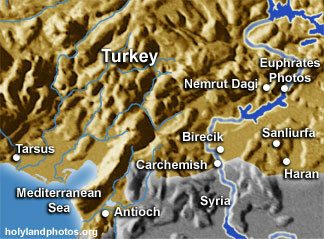 The Euphrates begins about 85 mi. [138 km.] due east of Erzurum. It is over 1,780 mi. [2865 km.] long - passing through Turkey, Syria, and Iraq before exiting into the Persian Gulf to the southeast.